Water marble.. my biggest nightmare. BUT! 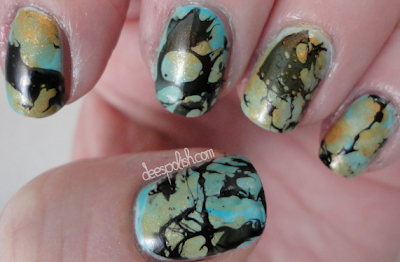 I have been wanting to try the whole 'spotted water marble' thing, so, that is exactly what I did. I followed THIS POST quite a bit.. 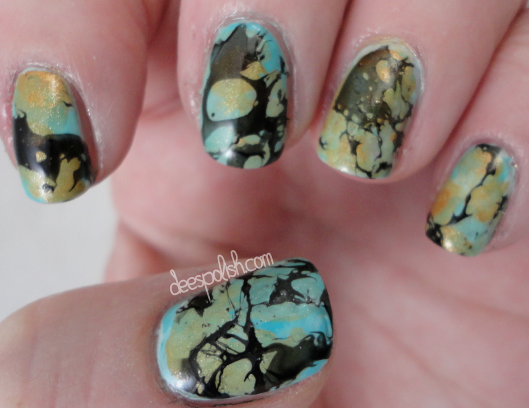 I used some different colours first, manipulated them with acetone, used more gold than I wanted to - also manipulated with acetone.. then.. I did the water marbling with the hand sanitizer spritz action.. Yup. Now, they didn't come out exactly how I wanted them to.. but I'm not overly disappointed either.. I think my pinky and my thumb are my favourites.. I used China Glaze Re-Fresh Mint, China Glaze For Audrey, Essie In The Cab-Ana, Orly Glitz, and Orly Liquid Vinyl. That is all for now - see you all again soon! !